Are you in? Early morning yoga challenge: 31 March – 4 April 2014. You are awake, full of energy and feel great. You don’t need any stimulants such as coffee to wake up. You feel proud of yourself. You will feel more zen. Categories: Sampoorna, Yoga classes, Yoga info | Tags: challenge, early, morning, Sampoorna, yoga class | Permalink. Categories: Yoga info | Tags: Acro | Permalink. 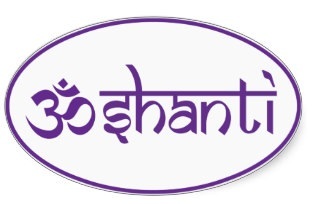 Would you like to receive regular information about (Sivananda) hatha yoga poses and philosophy, yummy vegan & yogic recipes, upcoming yoga classes, quotes, … ? It’s free to register to receive the newsletter, so feel free to sign up ! You can view past issues here. Categories: Yoga info | Tags: news, newsletter | Permalink. 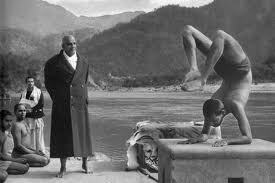 “A yoga teacher should be a yoga practitioner, not merely a preacher.” – Swami Vishnudevananda. Categories: Quote, Spiritual | Tags: quote, swamiji, Vishnudevananda, yoga | Permalink. I’m a huge fan of pesto and I’ve already posted a recipe of kale pesto before. Now that kale is no more in season (at least not here in Belgium), I’ve started exploring other ingredients to make pesto. Parsley is an excellent replacement for kale, it’s cheap too. It’s very nutritious, easy to find, to cultivate yourself (on your balcony if you don’t have a garden). Parsley is a great source of antioxidants, vitamin A and C, folic acid and iron. I love to mix parsley with sunflower seeds in this pesto recipe. Sunflower seeds are high in vitamin E (anti-inflammation), magnesium (keeping nerves and muscles relaxed), selenium (improved detoxification). Wash the parsley. Put it in your juicer, add sunflower seeds in between sprigs of parsley (to not jam your machine, don’t put all the seeds in at once). Squeeze the lemon. Mix the parsley & sunflower seeds paste with the lemon juice and cover it with olive oil to keep it fresh longer in your fridge. You can add some sunflower seeds paste if needed as well as black pepper. The pesto is delicious on toast or with raw or baked vegetables as well as with a pasta or gnocchi of your choice. In this picture (right), the pesto is served with orecchiette pasta and some nutritional yeast. * I use organic produce. 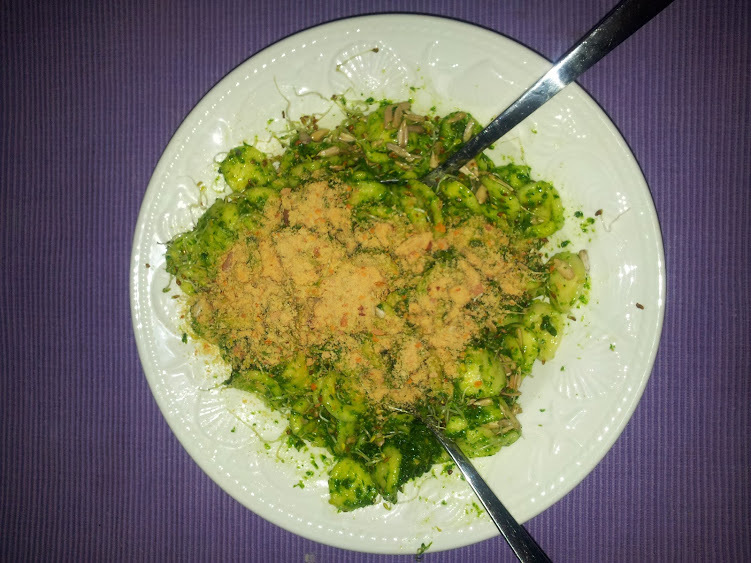 Categories: Yogi food | Tags: parsley, pesto, raw, recipe, vegan, vegetarian | Permalink. *I use mostly organic, unless impossible to find. Cut the tempeh in 1 or 2 cm pieces or strips. Marinate it for at least 30 minutes in a mix of shoyu or tamari sauce mixed with some olive oil and black pepper. Wash and cut the eggplant in cubes, add salt, leave it for about 30 minutes until the water comes out of the eggplant, use paper towels or a clean kitchen towel to wipe off the excess water. Sprinkle olive oil and black pepper on the eggplant cubes, spread out on an oven plate, in one layer and put in the oven. (You can add garlic if you like that’s not a sattvic ingredient, so I don’t use it in my yogi recipes). Add the tempeh in an oven plate and put in the oven as well. After about 10 or 15 minutes, turn the eggplant (or when well baked), idem for the tempeh. Cut the mozzarella cheese in thin slices. Wash the basil and shred the leaves. Boil a big pot of water for the gnocchi. When the tempeh and eggplant are well baked, transfer them to a big pot, add the tomato sauce, fresh basil and mozzarella cheese, add salt and pepper to your taste. You might want to add some fresh cherry tomatoes (when in season) and leave the sauce for an additional 5 to 10 minutes. Prepare the gnocchi according to the instructions. 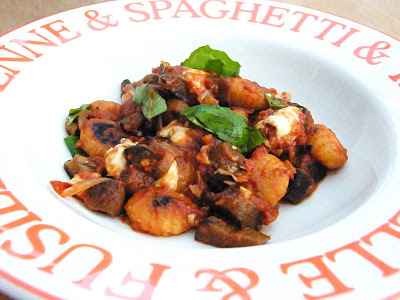 Serve the sauce on top of the gnocchi and serve directly. Garnish with some freshly washed basil leaves. You can serve the gnocchi with a seasonal salad. Categories: Yogi food | Tags: eggplant, gnocchi, italian, tempeh, vegan, vegetarian | Permalink.